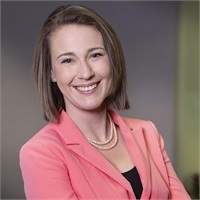 Rebecca Craig, ABA, CFBS is a Financial Planner, Wealth Management Advisor and Certified Family Business Specialist with Synergy Wealth Solutions, a comprehensive financial planning and investment management firm serving the Greater St. Louis area. Rebecca combines her comprehensive background in economic strategy, statistical modeling, financial accounting, financial planning and nonprofit development with her own entrepreneurial experience to design financial plans for businesses and individuals. Rebecca holds the Accredited Business Accountant (ABA) designation awarded by the Accreditation Council for Accountancy and Taxation® (ACAT). She earned the Certified Family Business Specialist (CFBS) designation from The American College of Financial Services in Bryn Mawr, PA.
Rebecca graduated with honors from Washington University in St. Louis (WashU) with her BA and academic concentrations in comparative political science, political economy, public policy, quantitative methodology, gender politics and applied statistics. Outside the office, Rebecca invests time and energy in giving back to the community by volunteering with local advocacy and charitable organizations. She participates in initiatives supporting education reform, women in business, holistic health and animal rights’ advocacy. Rebecca is also an Assistant Coach for the Parkway West High School Speech and Debate team. A self-proclaimed feline enthusiast, she happily resides with her Russian-Blue cat companion, Godric, in Clayton, Missouri.